Do you ever feel like you need a guide to help navigate your retirement? Retirement can be scary, but it doesn't have to be! Listen in to learn more about creating a RELIABLE and LONG-TERM retirement and download your COMPLIMENTARY Retirement Income Toolkit. 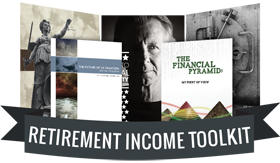 YOUR Retirement Income Toolkit provides you with information to help make sound decisions and build a retirement on a solid foundation that will stand the test of time. Request your complimentary Retirement Income Toolkit to get the information you need to help secure your retirement. Tara Nolan Advisory Services and Tara Nolan are not affiliated with or endorsed by the Social Security Administration or any government agency. This content is for informational purposes only and should not be used to make any financial decisions.